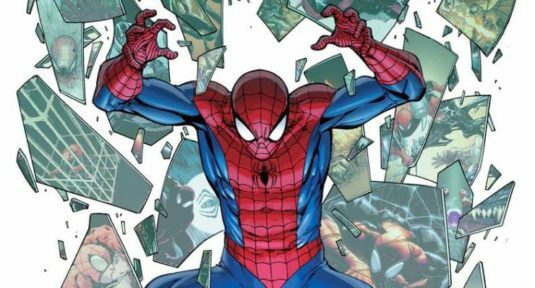 It’s been a “Superior” year-plus, but Peter Parker is now home righting the wrongs of the Green Goblin and picking up the pieces of “SpOck’s” life. 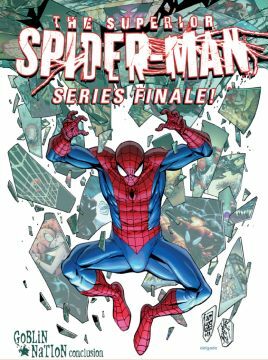 The series finale moves at a brisk pace re-establishing Parker into the Marvel Universe. Part of me dreads that we’re going back to Pathetic Pete’s mundane “power and responsibility” routine. Spoilers for the “Goblin Nation” 40-page conclusion ahead in this review! The Green Goblin has seized control of New York and Spider-Man’s body has been rightfully restored to his original owner. There’s little time to mope about the accomplishments and mistakes of Otto Octavius because Spidey must stop the Goblins and their Spider-Slayers and also save Anna Maria Marconi. Many of Parker’s allies become aware that the jerk swinging around Manhattan is no more. 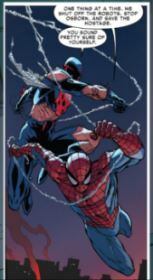 Miguel O’Hara, Spider-Man 2099, assists Spidey in his quest. Together, they are formidable such that we’re pining for the upcoming Spider-Man 2099 series. As this issue’s the Peter Parker Show, the Avengers, even Thor, are ineffectual. With a quip or friendly phrase, Spidey alerts friend and foe alike that he’s back. Dan Slott, Guiseppe Camuncoli, and others had me in some suspense when Anna Maria’s in peril. First, when the Oscorp building is about to blow and then when she gets a “Gwen Stacy” moment. I hope this isn’t the last we see of Anna Maria. She deserves some closure. About Peter Parker: he concocts a way to stop the Green Goblin, Norman Osborn disguised as Alchem exec Norman Banks, through the use of antidote-carrying Spider-Bots which deprive Osborn of his strength and healing. On the other hand, he’s also indirectly responsible for Osborn being on the loose because Liz Allan activates the Spider-Jammer allowing Osborn to escape Parker’s clutches. It’s not made clear how Osborn could make such a clean escape. One panel has him running away, but surely the Spider-Men could catch up to him. Thanks to the wonders (and limitations) of superhero comic stories, there’s not only fugitive Norman Osborn, but there are the amazing spider-twits who don’t stop him. 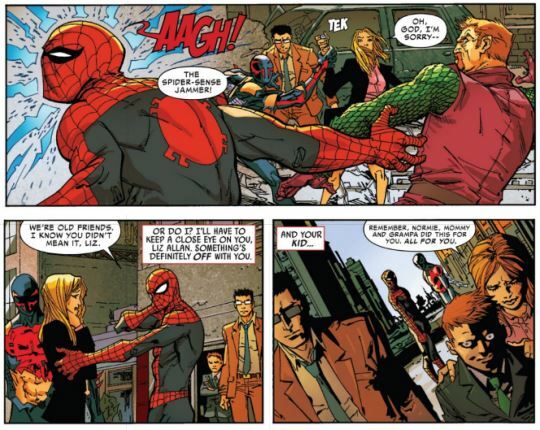 Norman Osborn’s gotta slip so he’ll keep tormenting Spidey. Panels edited from the issue. In the second story, “Actions Have Consequences,” Parker’s ex-girlfriends talk about what’s next in the aftermath. Carlie, not fully healed, decides to move down south. Mary Jane is staying put though she knows she’s a target as long as she’s in the Big Apple. Wow. This can’t be an important issue of Spider-Man without homages. Along with the “Gwen Stacy” moment, the famous “Face It, Tiger…” panel, and the “Spider-Man No More” cover are referenced. It’s nice to know that Peter is now in control, but I didn’t need to be reminded that Spider-Man is stuck in the never-ending loop that is superhero comic narratives. All that said, I look forward to All-New Amazing Spider-Man #1.NOW, NOW, NOW.